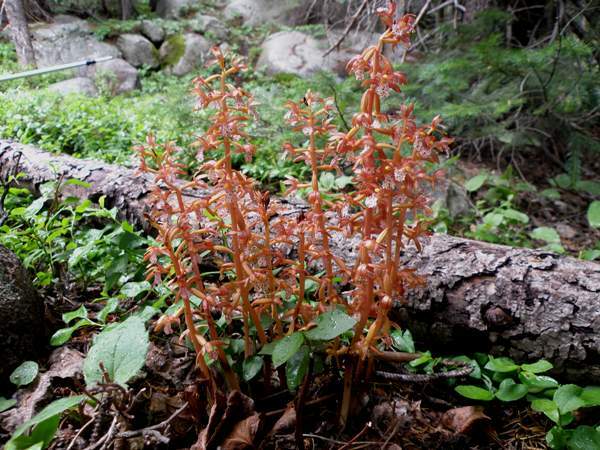 Western Spotted Coralroot Orchid, Corallorhiza maculata, must be one of the most attractive of the Coralroot Orchids, and like the other kinds of Coraroot orchids that grow in America it is much more robust and easier to spot than its European cousin Corallorhiza trifida. By far the prettiest of the coralroot orchids that occur in North America, the Western Spotted Coralroot has delicate flowers with brownish sepals and white lips which are covered in deep pink spots. 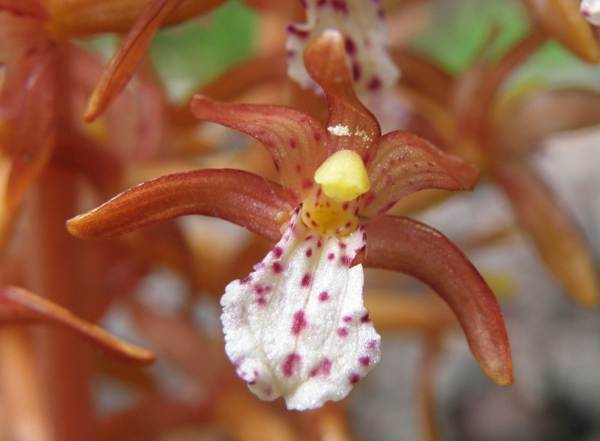 There are four different 'forms' of Western Spotted Coralroot growing in North America, and their ranges extend from as far north as British Columbia and east to Newfoundland, as far south as New Mexico and they also grow in California, Indiana, Arizona and Virginia. We have found and photographed two in the Rocky Mountains - forma immaculata and the one shown on this page. We have also been lucky enough to find Western Coralroot Orchid Corallorhiza mertensiana, another very attractive plant. The specimens shown on this page were photographed in Rocky Mountain National Park on the Loch Vale Trail during mid-July.